dude this place looks awesome! 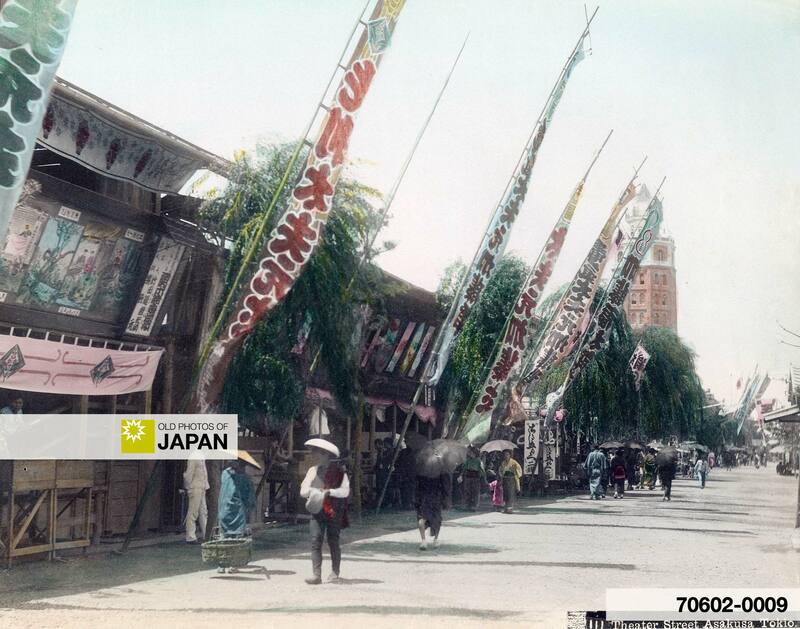 From the late 19th century on, Tokyo’s Asakusa Park was a park in the modern sense, an amusement park. This is where the masses went to enjoy themselves. 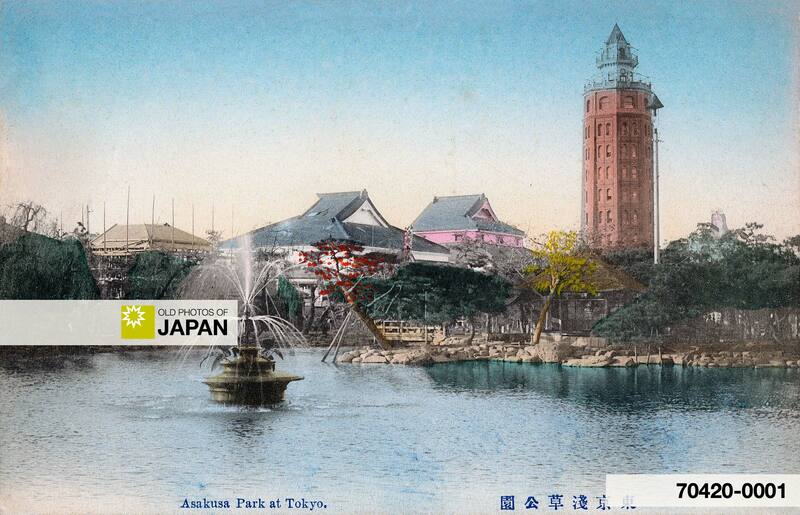 The park was filled with theaters, restaurants, unlicensed brothels, and once movies had reached Japan, scores of cinemas. Asakusa Park pretty much remained Tokyo’s main entertainment district until well into the 20th century, even surviving the devastation of the Great Kanto Earthquake of 1923 (Taisho 12). The symbol of the district, actually the symbol of all of Tokyo, was Ryounkaku, Japan’s very first skyscraper, better known as Junikai, or Twelve Stories, seen at the far back of this photo. Built in 1890 (Meiji 23) after a design by Scottish engineer William K. Burton (1856-1899), the 69 meter tall building was for decades the tallest structure in the city, twice as high as the Nikolai Cathredral. It was visible from just about anywhere in the city, and if in turn you wanted to see the city, you scaled it. Atago-yama was the only other place that rivaled it for panoramic views of Tokyo. In The Nightside of Japan, a book published in 1914 (Taisho 3), the Japanese author gives a wonderful description of the tower and the surroundings that brings to life the rawness of the area. At the east end of the street there stands a tall hexagonal brick building in twelve stories; its name is the Ryounkaku (Tower piercing through clouds), and popularly called Junikai (Twelve Story Tower). When the tower was first built the elevator was furnished for visitors; but shortly afterwards as there happened an unfortunate event, owing to incomplete adjustments of the machine, it was abolished by order. You step up to the top of the tower by the spiral steppings and, in rooms of each story, various kinds of toys and other articles are sold, or fine pictures and photographs are hung against walls. In 1911, one winter night at about eleven, a young man jumped down over the balcony of the eleventh story of the tower and killed himself, crushing his body upon the ground. After this event the windows and balconies above ten story are entirely covered with wire-nets. The Great Kanto Earthquake so badly damaged the tower, that army engineers had to dynamite the remains. It was never rebuilt. But thanks to many literary works that featured it, the tower still lives as a romantic image in Japan’s collective memory. 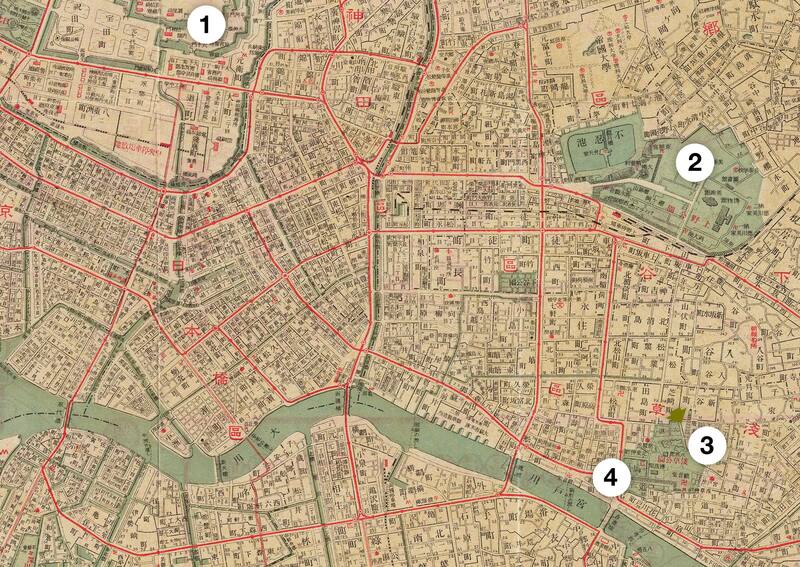 1910 (Meiji 43) Map of Tokyo: 1. Nakamise of Senso-ji 2. Asakusa Pond; 3. Ryounkaku. You can also licence this image online: 70602-0009 @ MeijiShowa.com.